In 2018, advertisers spent upwards of $5M per 30-second spot for Super Bowl LII. It's not surprising that they were strongly motivated to prove the ROI of their investments. Canvs offers these advertisers a unique perspective by measuring the audience’s Emotional Reactions to their ads – which is a leading indicator of brand recall. Holistically analyze the emotional impact of your campaigns cross-platform. Benchmark results against previous campaigns and/or industry norms. Brands always put forth their best effort for the Super Bowl, which is to be expected considering the cost. Some brands made this money worth it with memorable and entertaining spots, but a few might have been better off investing their marketing dollars elsewhere. We used Canvs Campaigns to get a breakdown of some of the more notable commercials in terms of Emotional Reactions. For each vertical, we created a cross-platform Canvs campaign for all Super Bowl Ads posted on Owned Facebook and YouTube. We then compared the performance of each vertical to benchmark what was “normal” for each category. We used these benchmarks to identify the most emotionally effective advertiser categories, and contextualize the top performers within them. Query 1: What were the most effective ad categories? Canvs reveals that Entertainment and Automotive brands resonated most, while CPG and Consumer Electronics didn’t. Driven by a handful of highly impactful trailers, Entertainment brands saw the highest ERs per brand among the most active categories. They drove 68% more Reactions per Brand than the advertiser benchmark. Automotive Ads came in second, with 48% higher Reactions per brand than the advertiser benchmark. CPG, though it was as active as Autos, didn’t get the same emotional response when posted on owned channels. Query 2: Which social platforms resonated most? Next we used Canvs to compare emotional ad effectiveness by source. 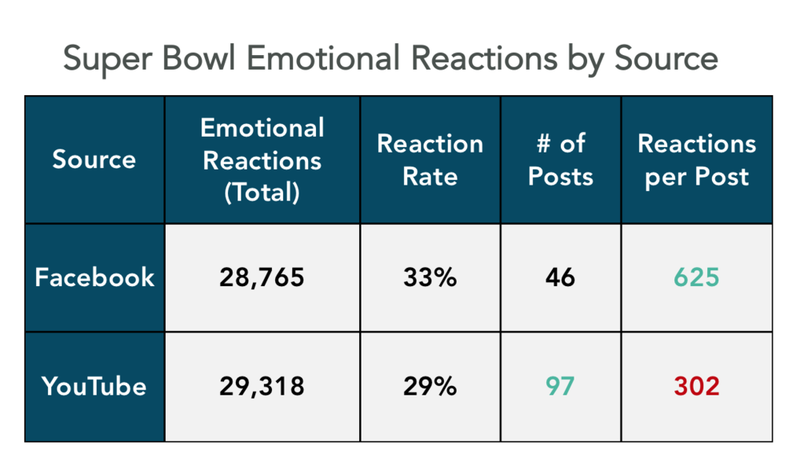 We discovered that while YouTube and Facebook were nearly neck and neck in total ERs, Facebook had more than twice as many Emotional Reactions per post. Even though there were half the number of Super Bowl ad posts on Facebook, they drove almost the same number of ERs. Additionally, fans were more passionate when discussing these ads on Facebook, demonstrated by a 4% higher Emotional Reaction Rate. Takeaway: Brands on Facebook already have active (and often friendly) fan communities. Sharing ads within these communities will likely be effective in generating additional engagement from Super Bowl content. Query 3: What’s the emotional signature of the leading ad categories? One the most valuable benefits of Canvs is its ability to identify the unique emotional makeup of an audience, a brand, or even a whole ad category. The top performing ad categories in the Super Bowl each had clearly identifiable emotional fingerprints when observed through Canvs. Entertainment was all about the wow factor. Trailers and show announcements saw significantly more Crazy and Excitement Reactions compared to the Super Bowl Benchmark. Hate was also slightly lower. Automotive ads were all about the Love. Both Love and Enjoyment were higher than the Super Bowl Ad benchmark. Hate and Dislike were also lower. Takeaway: The top performing categories each had emotions that aligned with desired brand outcomes. Query 4: What were the top performing ads according to campaign norms? Lastly, we used Canvs to identify the top ads from Entertainment and Auto and to explain why they performed so well within the context of campaign norms. The top ad within Entertainment and Automotive were top performers in their “signature emotions.” Marvel’s Infinity War trailer was the most Emotionally Reacted to Super Bowl ad. It was also among the most Crazy. Kia’s Feel Something Again ads were the top non-movie trailer ads, (Behind Solo and Jurassic World) ranking 4th in total ERs. It was also within the top 10 most Loved. Takeaway: The top performing ad categories each had specific emotional signatures – and their top ads had even more. Although $5M 30-second Super Bowl spots are an extreme example, buying ad space is an expensive and often risky business. Fortunately, Canvs Campaigns can help you to make smarter decisions about creating, optimizing, and measuring ad campaigns with emotion.